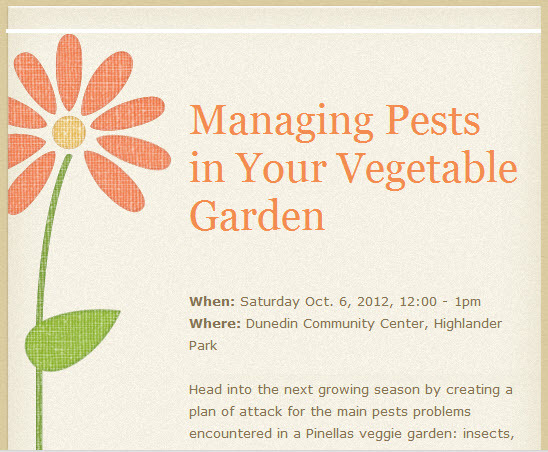 I will be speaking on October 6th at the Dunedin Community Center about managing pests in vegetable gardens at 12 noon. Below is the flier for this event - I would love to see you there. 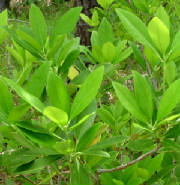 Laurel Wilt – new disease killing Redbay trees. Laurel Wilt is a fungal disease carried into host trees by the redbay ambrosia beetle. This is a disease of primarily redbay (Persea borbonia), avocado (Persea americana), and other plants in the laurel (Lauraceae) family). The fungus is carried into the tree in the mouthparts of the redbay ambrosia beetle (Xyleborus glabratus) as it bores into the tree. The fungus grows inside the tree stopping the flow of water and nutrients in the vascular system. This causes the leaves to wilt and the whole tree to eventually die. In addition to the trees mentioned above, reported hosts of the both the redbay ambrosia beetle and the laurel wilt fungus include swampbay (P. palustris), and sassafras (Sassafras albidum). The laurel wilt fungus has also been recovered from diseased plants of pondberry (Lindera melissifolia), camphor tree (Cinnamomum camphora), and pondspice (Litsea aestivalis). This invasive beetle was first detected in the United States in 2002 and Florida in 2005. 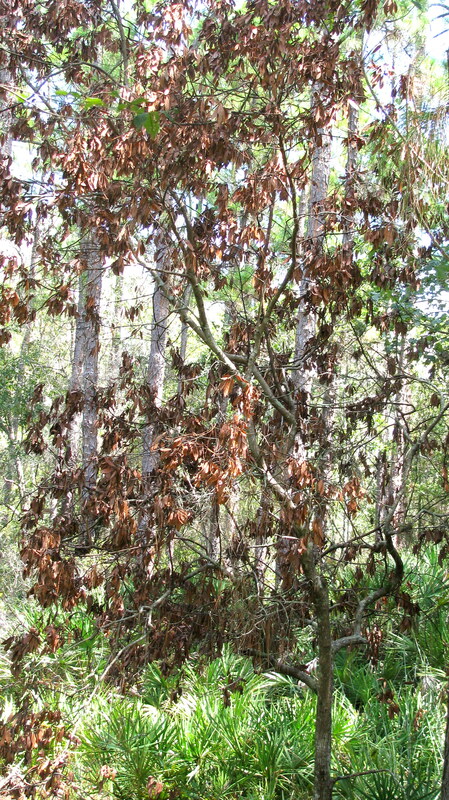 There have already been devastating levels of redbay tree death in Florida, Georgia, and South Carolina. In addition avocado trees have succumbed to this disease in both residential and experimental settings. This disease is now found in north Pinellas County in and around John Chestnut Park especially along the Peggy Park Trail. It is also killing redbay trees in Brooker Creek Preserve. I can see a dead redbay tree behind my house just inside the Preserve. 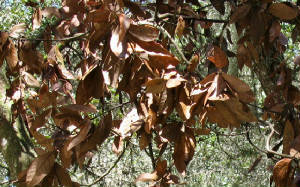 The Laurel Wilt fungus causes the leaves of affected trees initially to droop and turn a reddish or purplish color. You might see wilted foliage first only in part of the crown of the tree, but the whole crown will soon wilt. The leaves will turn brown and hang on the tree for a long time. There is not as much experience with this disease in avocado, but it appears that avocado trees might drop their leaves soon after wilting and turning brown. Another symptom is a black to brown discoloration of the sapwood in infected trees. By removing bark from wilted trees you will see this discoloration in streaks running parallel to the grain of the wood. You might also see tubes of sawdust a couple of inches long hanging on the trunk where the beetle has bored into the tree. Redbay is not a common landscape tree, but many of us have an avocado tree in our yards. If you find that you have one of these dead or dying trees in your landscape, it is important to remove it properly. This wood must not be moved from the area to use as firewood in another location, especially to counties where this pathogen is not found. Chipping the wood has been found to reduce the beetles since they cannot colonize chipped wood products. However, this chipped wood must not be removed from the county of origin to use as mulch elsewhere since there is a possibility that a few beetles could survive. This fungus has not been documented to spread by any means other than this beetle, but as a precaution, it is good practice to sanitize any tools that you use to cut an infected tree. I don’t think that there are many things more frustrating in the landscape than coming outside in the morning and finding that newly installed plants have been consumed or damaged by deer. We contend with this problem regularly here in North Pinellas County. In the past I have written about plants that I call “deer candy”, but this month I will focus on plants that I have used in my landscape that have not been damaged by deer in the twelve years I have lived right next to Brooker Creek Nature Preserve. I have found that many of the native plants are resistant to deer damage. 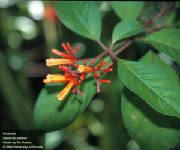 The natives that I have in my landscape that have not suffered damage are Dwarf Yaupon Holly and regular Yaupon Holly, Dwarf Simpson’s Stopper and regular Simpson’s Stopper, Dwarf Walter’s Viburnum (deer do nip off the flowers occasionally), Beautyberry, Coontie, Yellow Anise, Saw Palmetto, Swamp Lily, Blue Flag Iris, Rain Lily, Spider Lily, Gulf Muhly Grass, Firebush, and Sunshine Mimosa ground cover. Non-natives that have not sustained deer damage include Sweet Viburnum, Ligustrum, ‘Gold Mound’ Duranta, Foxtail Fern, Bird of Paradise, Variegated Flax Lily, Holly Fern, Bromeliads, Mondo Grass, Society Garlic, and Palms. My decision to use these plants was mainly trial and error. 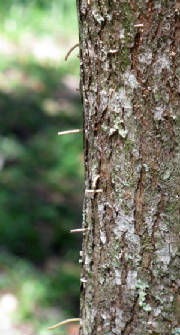 There are lists of plants that deer damage and that are deer resistant. The University of Florida has one: Ornamental plant susceptibility to damage by deer in Florida (http://edis.ifas.ufl.edu/pdffiles/UW/UW13700.pdf). However, deer will try new plants when they are hungry and if they find them tasty, they will keep coming back to them. 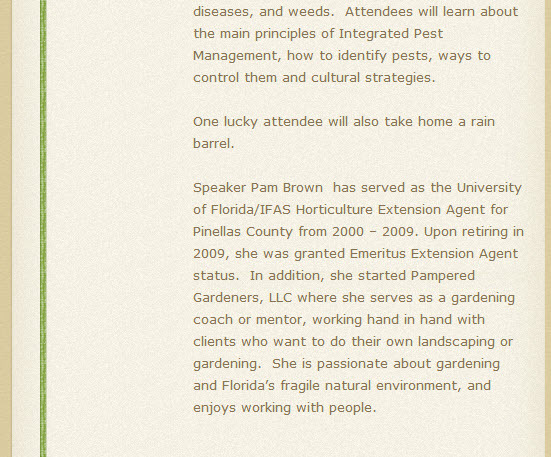 Ane, where deer densities are high, as here in North Pinellas, even plants that are normally avoided can be eaten. Deer repellant sprays come in tow knids, smell based and taste based. Both types work for a limited time, so you need about three different ones so that you can rotate what you use each time you spray. If you are thinking about fencing, the fence needs to be at least eight feet tall. Electirfied fences work too, but are not practical in a densely populated area like ours. Fences that are solid that deer cannot see through are also effective. I believe that a better strategy is to just say 'no' to deer candy plants, choose resistant plants, don't replace damaged plants with like kind, use mostly native plants and wildflowers, and lastly, be willing to share with them. Every once in a while I find an article that I have written that needs repeating. If you have pets, this one could be of importance to you. There are some plants that we use in our Florida landscapes that can be deadly if consumed by pets; azaleas, cycads or sago palms, and oleanders. Others can make animals sick. We are usually familiar with the Dieffenbachia or dumb cane dangers since they affect humans too. Chewing on this plant can lead to suffocation because the Calcium Oxalate crystals in the plant tissues cause the throat to swell. But, there are many more common plants that are used in the landscape and as house plants that can cause distress for our pets. Some of the common house plants are aloe, amaryllis, caladium, peace lily, calla lily, elephant ears, philodendron, antherium, and pothos. Cats are particularly sensitive to lilies like amaryllis, daylily and crinum. Other plants that we use in our landscapes that can be toxic include; dracaena, kalanchoe, hydrangea, lantana, yucca and iris. Even tomato plants are toxic. The Veterinary Pet Insurance Company’s list of top 10 list of plant poisoning claims include fruits and plant parts. While raisins and grapes caused the most problems along with some other edibles, many of our familiar plants are on the list. · Number 4 is Lily - the poisonous component for cats has apparently not been identified, even ingestions of very small amounts of a lily plant could result in severe kidney damage. · Number 7 is Sago Palm - All parts are poisonous, but the seeds contain the largest danger. The ingestion of just one or two seeds can result in vomiting, diarrhea, depression, seizures and liver failure. · Number 10 is Hydrangea – ingesting parts of this plant can result in a gastrointestinal disturbance with vomiting, depression, and diarrhea. If you have pets and also have any of these problem plants, use common sense. If your pet does not usually chew on plants, then it shouldn’t be a problem. If you have a dog or cat that likes to dig, then Amaryllis, caladiums, and other bulbs may not be appropriate for your landscape since they might dig them up and decide to chew on them. You could consider removing the toxic plants or fencing the area off to the pet. Several of the plants I listed are also used as house plants and that could create a problem. Sometimes animals, especially dogs, which are bored, will chew just for the fun of it. If you choose to keep the plants, familiarize yourself with the symptoms that a pet may show if they ingest one of these plants and seek help immediately if your pet shows any of these symptoms. This list is not complete. If you are concerned about any plants, do some research at the library or on the Internet. If you still have questions consult with your veterinarian. 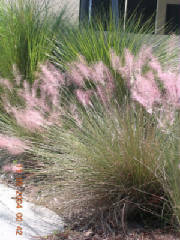 The ASPCA web site has comprehensive searchable information about plants that are toxic or non-toxic to pets: http://www.aspca.org/pet-care/poison-control/plants/.